Cookies are your best tea time partner, and so is these Cranberry Pistachio Cookies. The buttery crumb on the crunchy pistachio and the chewy cranberries makes a perfect combination. You will not be able to resist the melt-in-mouth flavor of these cranberry pistachio cookies. Read the medical benefits of Cranberries here. If you are cholesterol issues Pistachios can help. These dried cranberry cookies have a great visual appeal. Looks ornamental. No matter how much I bake them, these cranberry cookies do not stay for more than 3 days on my shelf. 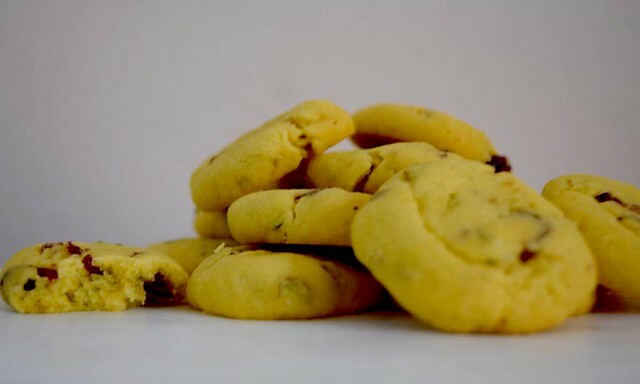 For these ornamental cookies, I made a quick sprint of making a basic butter dough and included my favorite dried red cranberries along with chopped pistachios. Believe me, the red cranberries and green pistachios into that yellow buttery dough looked like gems into a gold ornament. Every time I bake these cookies, I get mesmerized. I am still trying to figure out whether it is the color, the taste or the aroma that pulls me towards these cookies. 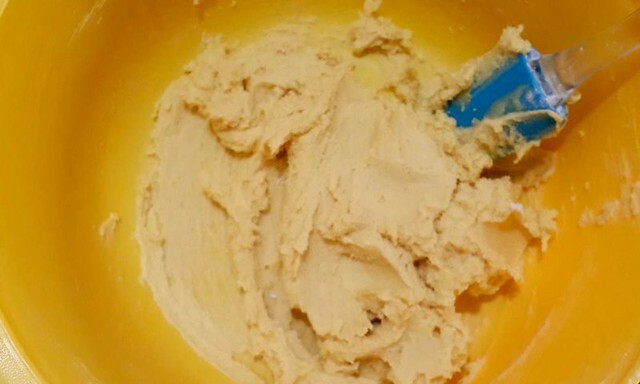 You will be surprised to know that you can freeze this cookie dough for up to 3 months. You can then enjoy fresh-baked cranberry cookies whenever you want or in a hurry. 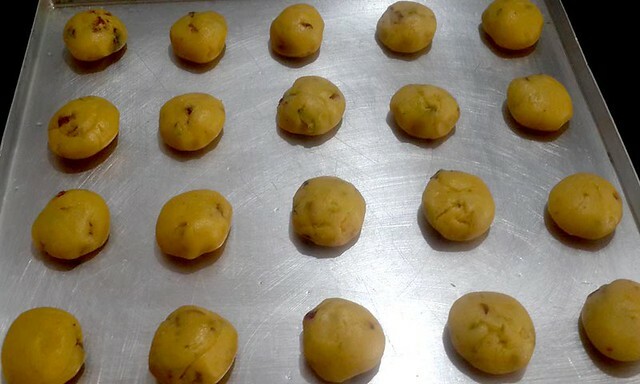 I generally keep the stock of cookie’s dough in my freezer to treat my guests with baked cranberry pistachio cookies. This idea helps a lot in case of some unexpected guests. No matter whatever the reason is but having cookies dough ready in your freezer is always a good idea. In a bowl, take butter, sugar and vanilla essence. Cream/ whisk these to get the soft and creamy texture. 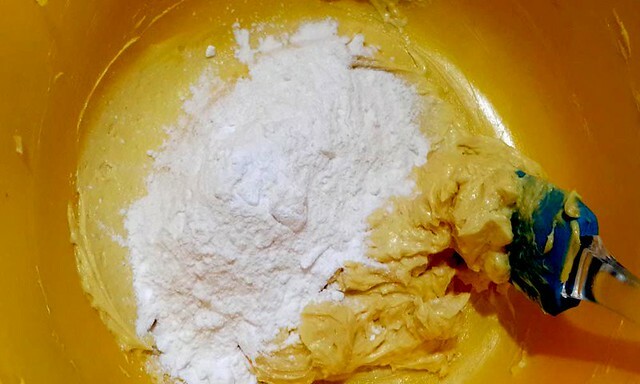 In a separate bowl, mix flour, salt, and corn-starch. 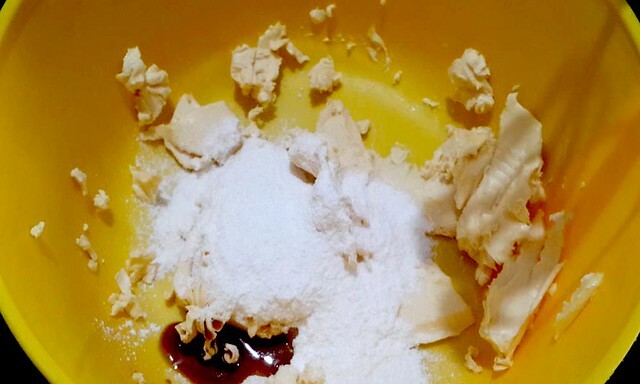 Now add dry ingredients into wet ingredients and gently fold to bring them together. Do not over knead the dough. Mix chopped cranberries and chopped pistachios into the dough. Now make small lemon size portions of the dough and place them on a greased baking tray by leaving some space in between. Bake these cookies in a preheated oven at 160 °C for 15-18 minutes. Once the corners of cookies turn golden, take these out of oven and place on a wired rack for some time. 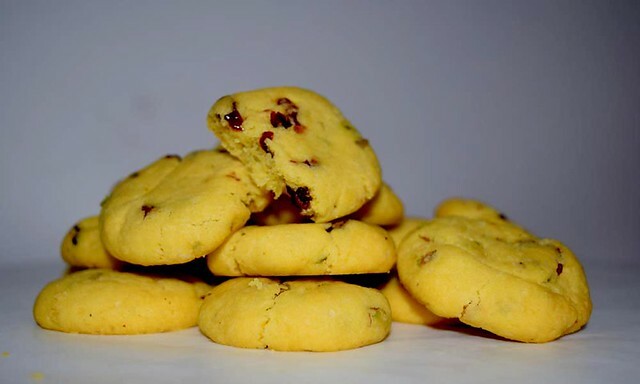 Delicious Cranberry Pistachio cookies are ready to serve. 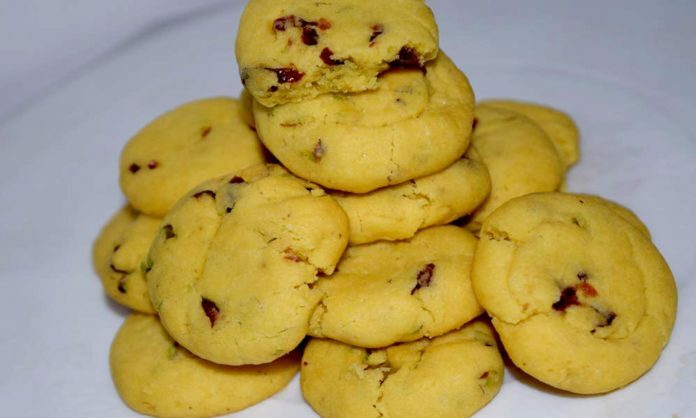 Check out this ornamental cranberry pistachio cookies recipe. This pistachio cranberry cookies are divine. 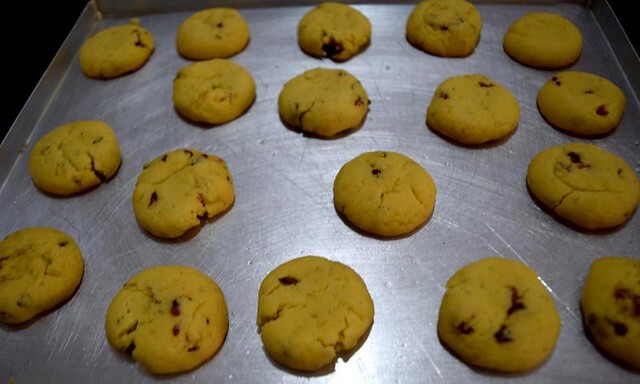 Loaded with health benefits of cranberry and pistachio, these are easy to do pistachio cookies at home. Cream/ whisk these to get soft and creamy texture. In a separate bowl, mix flour, salt and cornstarch. Note- If you are using salted butter then don’t add salt to the flour. Mam I tried these cookies but my cookies burnt from down though I placed them on parchment paper.this has happened with me before also when I baked naan khatai.should both upper nd lower rods to b ON mode. – For cookies, use the middle rack while baking. – If you have a small oven, reduce the temperature a little. 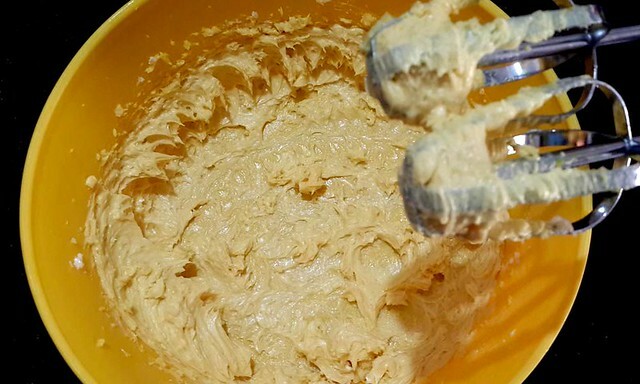 – Use only bottom rods for baking cookies. Are these fresh cranberries?after making dough is their no need to freeze for some time? These are dried cranberries. 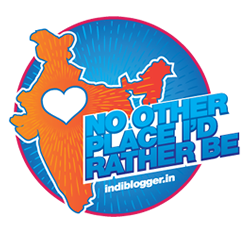 If you feel that the butter has melted in the dough and the dough has become, you may refrigerate the dough for sometime. Also, if you put the dough in refrigerator for sometime, it is only going to make it easier for you to shape it.